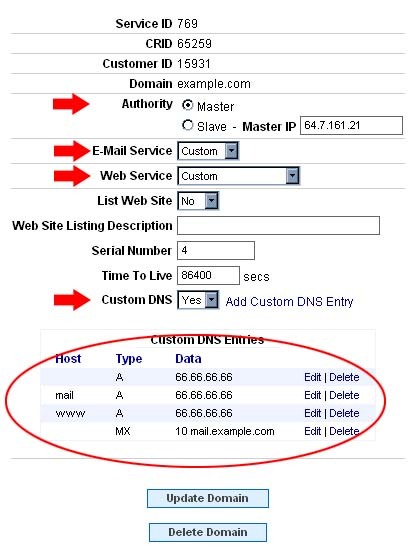 This article illustrates and explains how to configure Custom DNS for customer hosted Web Services. First, make sure that the Authority is set to Master, As Mercury's DNS servers will provide Authoritative DNS service for the domain. Set the E-mail Service and Web Service both to "Custom". Then, make sure the Custom DNS box is set to "Yes". 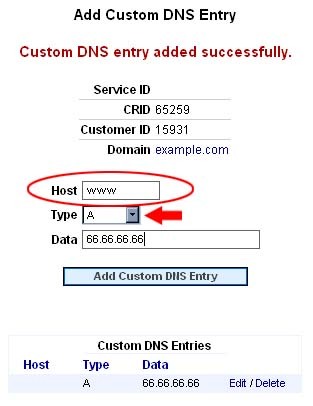 Click the "Add Customer DNS Entry" to begin entering customer DNS entries for the domain. This is the screen that you will see when entering a Custom DNS entry. 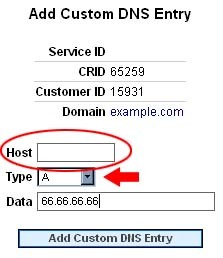 When entering a Custom DNS entry, make sure you select the proper record and fill in the proper host for the DNS entry you're entering. For example, for a web site entry, the host would be "www" and the record would be "A". In the "Data" box, type in the IP address where the web site can be found. When finished, the screen should look similar to the picture below. When you are sure the information entered is correct, click the "Add Custom DNS Entry" button to save the changes. The new DNS entry will be listed below. Follow these same steps for any other records that need to be entered.